UF/IFAS professor Jude Grosser (center) walks the Tropicana–UF/IFAS test grove with a tour group near the Citrus Research and Education Center in Lake Alfred. Grafted orange trees showcased at the 100th anniversary of the University of Florida Institute of Food and Agricultural Sciences (UF/IFAS) Citrus Research and Education Center (CREC) may give the state’s citrus growers new reason to hope the industry can cope with the citrus greening crisis, UF/IFAS researchers say. University of Florida scientists and Tropicana are teaming up to test promising new UF/IFAS-bred citrus varieties for greening tolerance and better-tasting juice. Tolerance means trees are infected and remain infected, but they still perform adequately to make a profit, UF/IFAS researchers say. Resistance means the trees fight off the infection – either reducing the infection to a very low level or getting rid of it completely. “I’ve been out to the site twice in the past year and some of the rootstock-scion combinations just jump out at you with the lush green foliage and, more importantly, a large number of nice-sized fruit,” said UF/IFAS CREC Director Michael Rogers. 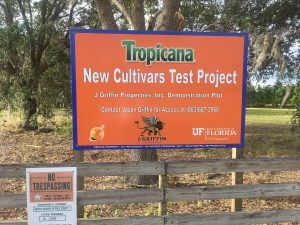 Tropicana leases 14.5 acres for testing new selections, including UF/IFAS-developed citrus cultivars and rootstocks, in a commercial grove about 4 miles from the UF/IFAS Citrus Research and Education Center, said Jude Grosser, a UF/IFAS professor of horticultural sciences and a faculty member at CREC. UF/IFAS researchers have a long history of working with Tropicana, Grosser said. “This trial is providing strong evidence that the combination of improved scion genetics, improved rootstock genetics and optimized nutrition programs is the ticket for the immediate future,” Grosser said. For example, the combination of UF sweet orange OLL-8 cultivar on UFR-4 rootstock looks exceptional for both yield and tree health, Grosser said. The relationship between Tropicana and UF/IFAS goes back many years. Rocco Simonetta, who’s now retired from Tropicana, spearheaded the UF/IFAS-Tropicana project field trials – with the first two trials focusing primarily on sweet orange selections in our pipeline that might be good additions to their not-from-concentrate (NFC) portfolio, Grosser said. The current trial focuses more on the addition of new rootstocks necessary to deal with HLB. Cheryl Nagle of Tropicana worked with Simonetta at the beginning, and she passionately followed up on building the relationship after his retirement, Grosser said. She now is in charge of the trials. “This is all truly a team effort,” he said. Tropicana and UF/IFAS started their collaboration on the current project in June 2013, said Allison Drown, who manages the grove near Lake Alfred for Tropicana. “We monitor tree health, fruit yield and juice quality,” Drown said. Grosser commended Tropicana’s interest in testing many new IFAS selections in their citrus trial. 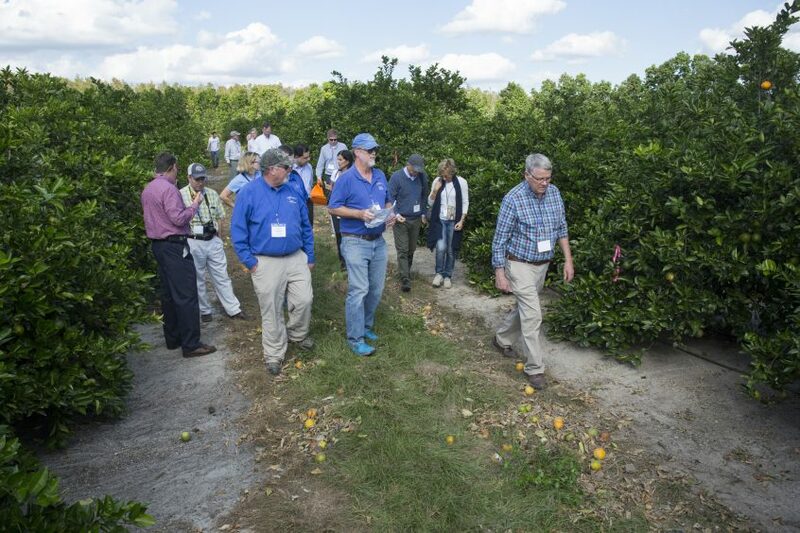 “Tropicana has taken no shortcuts – they are employing state-of-the-art management of the trial,” said Grosser, who led a tour of the private groves at the Nov. 29 centennial celebration of the UF/IFAS CREC. Tropicana and UF/IFAS breeders started with about 30 scion selections — or descendants of other varieties, Grosser said, but because of citrus greening, Tropicana decided to look at new and improved rootstocks as well, he said. Citrus scientists use traditional plant grafting to put together combinations of new scions and rootstocks created in the breeding program. In plant grafting, scientists call the upper part of the plant the scion, while the lower part is the rootstock. Grosser said he sees promise in about half a dozen scion-rootstock combinations in this trial, most of which are releases from UF/IFAS CREC. Based on UF/IFAS data, UF/IFAS citrus breeders suggest new oranges, orange-like hybrids and rootstocks from the CREC citrus improvement program that they think Tropicana might be interested in for future use in its business, Grosser said.